Email marketing has been a tried and true method of getting information to customers in a timely and cost-effective manner. However, what it has not done is fostered direct, 1-on-1 customer engagement. 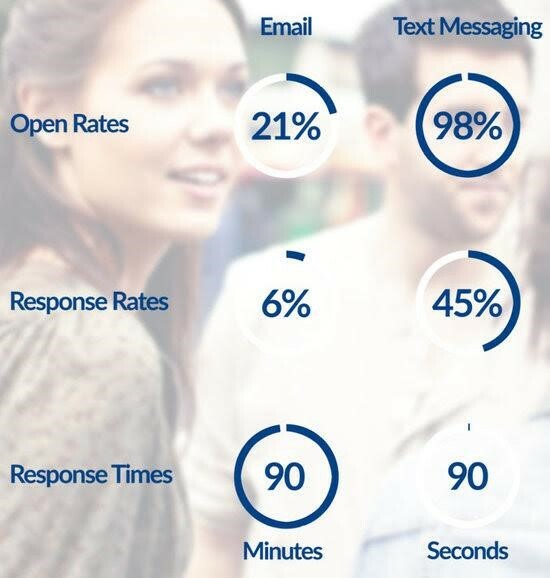 This is particularly evident from the response times, with email taking 30 times longer to generate a response versus text messaging. This type of response time shows a truth about this type of communication: email does not fit in with the busy lives of customers. It requires access to the web, and it requires a long, thought-out response. Most people do not have the time to sit down and communicate with their financial institutions about something in email format. Text, on the other hand, takes a number of different modern communication factors into account. Not only does it allow consumers continued contact on their own schedule, but it also ensures that the communication form they are using fits with their abilities and lifestyles. Additionally, many customers do not have access to computers or email through mobile. However, most do check their texts much more often than their emails. On the customer support end, this means that problems are being resolved more quickly via text. On the marketing end, this means that exclusive offers are easily accessible for delivery. Which makes you ask the question, is email dead? Either way, you cannot argue with hard statistics, and statistics say that the future of text marketing is bright.